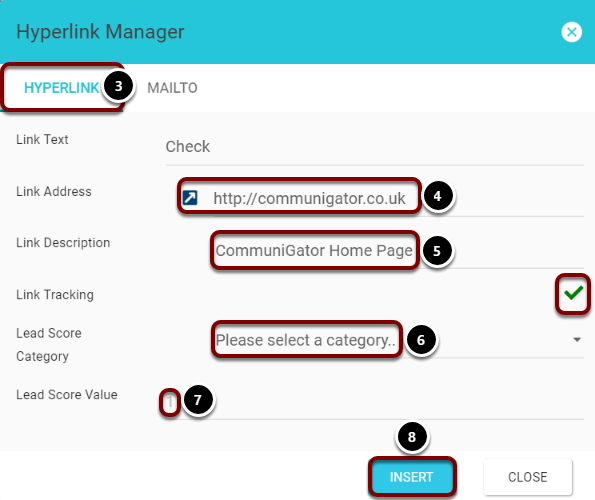 This article takes you through creating a tracked mailto link within GatorCreator, allowing you to report on email responses along side your normal website tracking, document links etc. 3. 'Hyperlink' Tab. This is selected by default. Once the link is in place a blue arrow icon will appear next to it. Clicking on this will open the URL in a web page. This is useful for checking if your link is correct. 5. Enter your 'Link Description'. 6. If you have a Lead Score you category to place the page into then choose it here. 7. Provide a Lead Score Value if necessary. The 'MAILTO' tab struck out in the image above and below, can be used but only if you wish to create non-tracked links. Note: The only negative outcome to creating tracked mailto links is that it will open a blank browser window/tab on launching the new email reply, see below. What Gator Creator can do for you!